Summer is here and staying cool while enjoying as much outdoor time as possible is a priority around here these days. As parents, we always tend to think of the kids first when preparing meals and snacks, but what about us? With scoops and bowls of our favorite Breyers ice cream being doled out left and right last weekend, I thought to myself, what about ME? And here’s my answer. Chewy home made caramel chocolate chip cookies with creamy ice cream sandwiched in the middle, then dipped in chocolate…aka The Ultimate Ice Cream Sandwich. 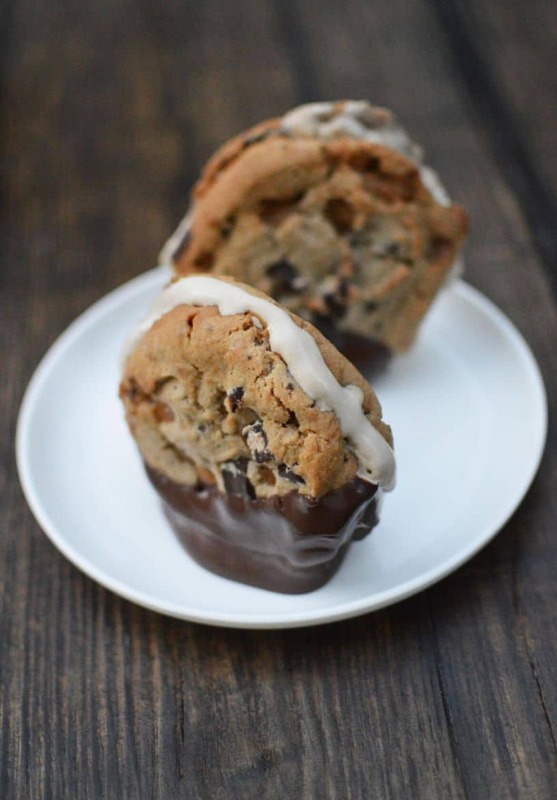 Ice cream sandwiched between chocolate caramel chip cookies and then dipped in chocolate! Combine the wet cookie ingredients until creamed and smooth. Slowly mix the dry ingredients into the wet until the batter is thick but still easily mixed and wet looking. Fold in the chocolate bits and caramel bits until evenly distributed. Place parchment paper on baking sheets and add large round and flattened balls of batter that are evenly spaced. (You’ll want larger cookies for the sandwiches). Bake at 350 degrees until the cookies are golden at the edges and still slightly underdone looking at the center. Remove from the tray and place directly on a clean, surface until fully cooled. Only once the cookies have fully cooled, place a generous amount of your Breyers ice cream on one cookie, filling to the edges and then place a second cookie on top. Do this for all of the cookies and then immediately place them in the freezer. Allow the sandwiches to freeze together solid like this for at least a couple hours. When you are ready to dip the cookies, melt the chocolate per package instructions. 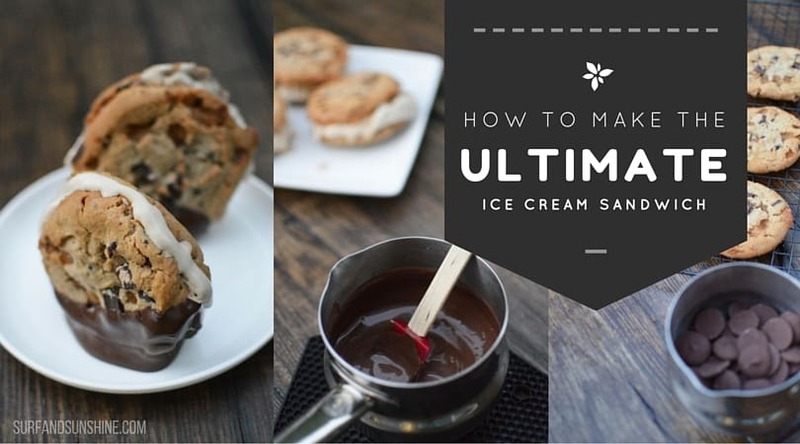 Try to keep the temperature as low as possible in the chocolate to prevent the ice cream from starting to melt. Quickly dip the cookies one at a time into the chocolate and then return to the tray to refreeze for at least another 30 minutes before serving. The actual cook time for the cookies will depend on your oven and size of your cookie batter balls, but plan for roughly 10 to 12 minutes. Enjoy ice cream truck treats and collect rewards by stocking up on all your favorite frozen treats. From May through September, purchase $20 worth of Unilever ice cream products at participating Safeway, Albertsons, VONS/Pavilions, Randalls, Jewel and Tom Thumb stores and submit your receipt(s) to receive a $5 reward. There’s up to $575,000 in rewards available! Visit this website to submit your receipts. This is going to be a sweet summer! *NO PURCHASE NECESSARY. Void where prohibited. Ice Cream Rewards Begins 5/1/16 and ends 9/30/16. Unilever Ice Cream Sweepstakes 5/6/16 and ends 9/30/16. For complete Official Rules, visit IceCreamRewards.com. The Beer of the Golden Dragon and a Beer Cake Recipe?